Lush Fab Glam Inspired Lifestyle For The Modern Woman: Tips For Taking Control Of Your Credit & Finances. Tips For Taking Control Of Your Credit & Finances. The upcoming months are not just known for all the celebrations but also for the fantastic sales, discounts and deals that sends us into a shopping frenzy. As we stock up on the items on our wish list, buy gifts for family and friends and get a few extras just because the prices are incredible. Unfortunately for many of us this shopping season also ends with a lot of remorse when we finally tally up the bills and realize just how grossly we've over spent, even when we created a shopping budget. While we immediately see the impact that this has on our wallets and bank accounts. The unintended impact to our overall financial well-being, especially our credit rating is something that we don't consider until the damage is done. This is why we have teamed up with Credit Karma™ to share some fab tips that will help you take control of your credit and finances before the shopping rush. Whether you are an organized shopper with a shopping list and planned spending budget for the or if you simply go out and enjoy the shopping experience no expense speared. You should always stay abreast of your credit information, know the balances on your credit cards and understand your credit rating. Especially how every missed payment can affect your ability to qualify for jobs, your next cell phone plan, car purchase/lease or affect your ability to rent an apartment or buy your own home. While around 220 million Americans have a credit profile, statistics show that over 33% have never checked their credit report and 25% of consumers have errors on their credit report that can negatively impact their credit rating. 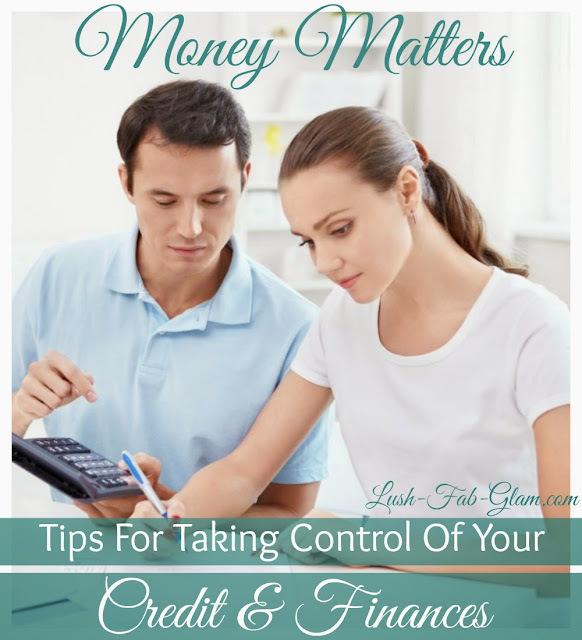 Below are some very important tools and tips to help you take control of your finances and credit. We believe that knowledge is power. When we actively monitor our credit profile, are aware of what negatively affects our credit rating and know the steps to take to improve our credit score. Then we are better equipped to make sound, non-impulse decisions where our finances are concerned. We recently had the opportunity to try out an amazing free credit monitoring service called Credit Karma™. Founded in 2007 Credit Karma™ is pro-consumer and believes everyone should have frequent and free access to their credit information. Credit Karma™ monitors your credit on a daily basis and notifies you when there has been any significant changes on your report. Unlike other companies Credit Karma™ will never ask for your credit card information and most importantly there are no hidden fees! Plus with Credit Karma™ you can access your full credit report and score from the comfort of your computer or cell phone on a weekly basis and you have the option to print your historical and/or most recent credit reports. Plus you can use redit monitoring as an added layer to prevent identity theft. Click here to sign up for Credit Karma's™ free credit monitoring service. 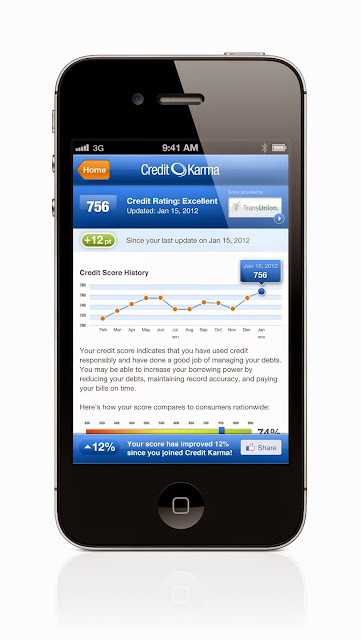 Credit Karma™ credit rating on your cell phone. Understanding your credit score and profile can be confusing, thankfully, Credit Karma™ offers several tools and resources to help you fully understand your credit data and what impacts it so you can take control of your credit and finances. For example, there are more than 50 FICO branded scores from each of the major credit bureaus. The credit score offered by Credit Karma™ is not an educational score — it’s a real score. And the TransUnion credit report that you receive from Credit Karma™ is one of the three credit reports used to evaluate all consumers when it comes to lending decisions. You will see an overview of your full credit report including your current credit score on Credit Karma™. Credit Karma™ is more than just a credit monitoring service, as we mentioned before they not only want to help you understand your credit profile but also help you take steps to improve it. A cornerstone of Credit Karma’s™ mission is assisting consumers with shopping for financial products. They have worked with more than one hundred lenders (credit card issuers, loan providers etc.) so that they can feature products and offers tailored to each member’s unique credit profile. Whether you have no credit and need to grow your credit history and score, simply need to monitor and maintain your credit score or you have a low credit rating that you would like to improve. Credit Karma™ is able to conduct an in-depth analysis of the likelihood that you will receive credit approval. And most importantly they will match your credit and personal finance profiles with financial products that make sense for you. This saves you time, takes away the hassle of shopping around for credit and you avoid the negative impact that a credit card or loan denial would have on your credit score. 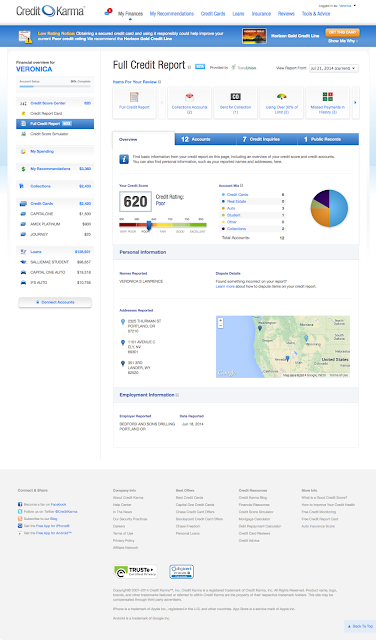 Your Credit Karma™ profile displays all your credit accounts, payment status and balances. 1. Once you miss a payment or you are late making a payment it is really hard to get your credit score back to 100%. In fact 99% on time payments only gives you a B score so it is extremely important to make all your payments on time. 2. A hard credit inquiry is marked on your credit score when you apply for new credit, it does affect your score by a few points and lasts for up to two years. Do not apply for too many new credit accounts in a short space of time. 3. It is important to keep track off all credit inquiries on your profile in the event that it is a case of identity theft. If you notice a credit inquiry on your profile that you did not apply for, resources are available to help you find out more about that inquiry and to educate you on how to dispute it. 4. It is important to keep in mind that if one of your credit cards has gone unused for a long period of time your creditor might choose to stop notifying the credit bureau about your credit activity. This could potentially hurt your credit utilization score which plays a big role in your TransUnion credit score. Instead of tucking your credit cards away in the back of a draw and forgetting about them, use them to make small purchases like dinner or dessert every now and then pay it back in full within it's billing cycle. To learn more about how your credit score is calculated, what affects it, how to improve it and more amazing tools to help you monitor and control your credit rating, visit Credit Karma™ and sign up for your free profile today. Do you understand and actively monitor your credit rating? Share with us by leaving a comment below. Want to be featured on Lush-Fab-Glam.com? Do you have a product, service, brand, website or event that you would like to introduce to our readers? Click here for details on how to be featured. Troubling stats about the number of Americans below a 720 credit score. I really should implement these tips and you're so right I always regret over shopping when the bill comes,. Can't wait to try this seeing my credit score and CC balances will be more effective than the budget App I am using.